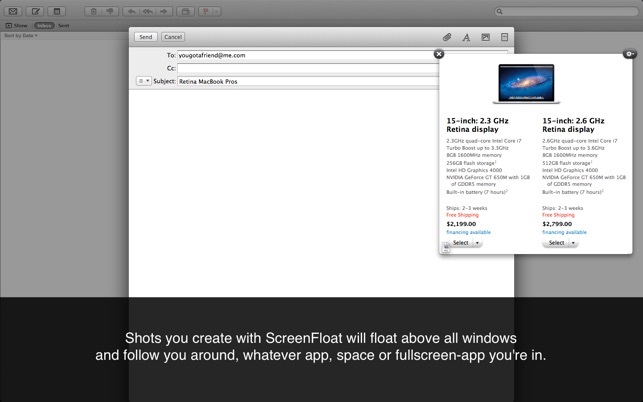 Use ScreenFloat to create floating screenshots that are always visible, no matter which application you're in. 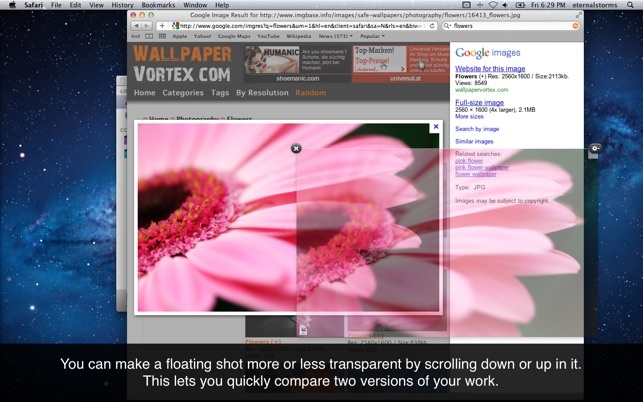 This way, you don't have to move or resize windows around to keep information visible on your screen. no matter which application, space or fullscreen app you are in. Shots can be changed in size, or in opacity by scrolling up or down within them. for later reference when you close them. where you can name, tag, organize and categorize them. to any application that handles image files. a default application you can specify for even quicker export. 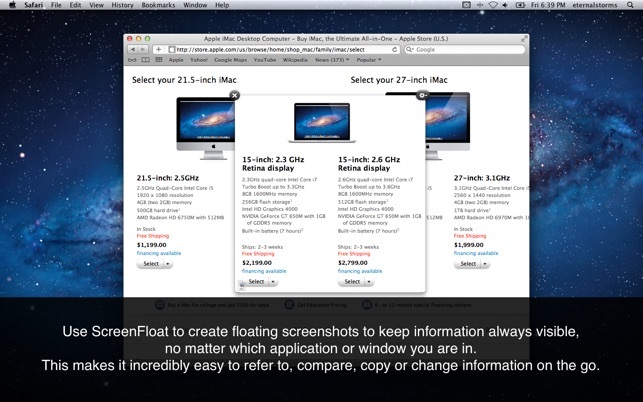 For a video and further information, please visit ScreenFloat's website. If you have any feedback or questions, please do not hesitate to write me by mail at support@eternalstorms.at, or on twitter at @ScreenFloatApp or @eternalstorms. I had heard about this app a few months ago. I finally got around to purchasing it and I’m really, really happy I have. It’s a massive time-saver and saves me the annoyance of having to take screenshots and then going through the work of finding them and placing them where I need to which (in the past) involved having a finder window open and then dragging it into the editor I was working in. For example, as I watch videos teaching me how to use a program or whatever, I’ll take notes in an editor while I watch the video. Sometimes I want to grab a screenshot to drop into my notes to highlight a particular point. 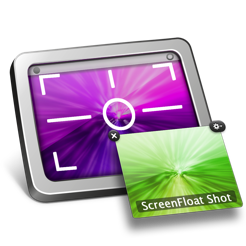 With ScreenFloat I can take that screenshot and have it float in my view where I can then copy it and drop it into my notes immediately instead of digging around in my file structure to complete the same task. The app is a little more powerful than that and I can see how it’ll come in handy for other tasks (like another reviewer mentioned taking a screenshot of server settings and having it simply “float” there while you type it all in instead of having to copy and paste it somewhere) but even just using it in the way that I am it’s a great utility. Well worth the money and I highly recommend it. Thanks, dev! You may think to yourself, “I don’t see why I’d need this, I can already use the Mac’s built-in screen capture functionality, it’s fine.” I get that, but here’s what you’re missing. In just one day of using your computer try to pay attention to how often you need some information from another window, another space, or another app. You switch from window to window and back again, making sure you got it right. Or maybe you spend time resizing a bunch of things so you can see all of them at the sizes you need to. You might be a designer who needs to temporarily recall some RGB values in a Photoshop palette or dialog box. Or maybe you’re a developer who needs to recall the sizes of a couple of views but can’t have them on the screen at the same time. Boom, ScreenFloat is the answer. Just type your hotkey, drag around the thing you need to recall, then put it out of your mind and switch back to your other task. There’s the info, floating right where you need it, even though that other window/app/space is no longer visible. 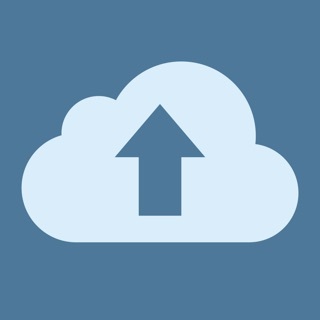 This app saves me hours of stupid switching back-and-forth or copying-temporarily-to-notepad or resizing windows or dealing with giant full-screen screenshots or writing on paper (heaven forbid!). I purchased this app because I use Apples screen capture a lot but find it restrictive and cumbersome to use. 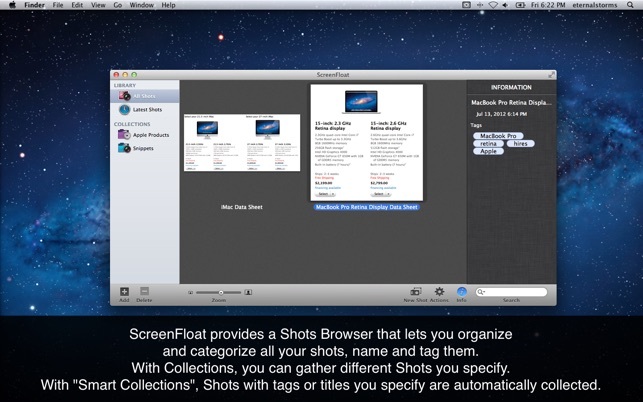 This app floats the shot around, has a shot browser and can move between applications. These functions have made my workflow 100% more efficient. 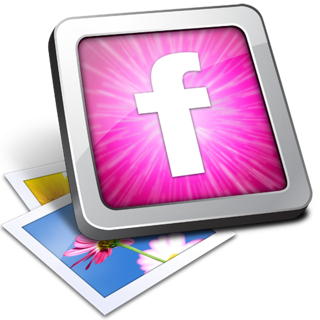 The app sits in the menu bar and is really easy to use. When I first used it I did have a problem which I reported to Matthias at Eternal Strorms Software. He did recreate what I did and it worked on his system which lend me to the real problem which was Apples (They have a workaround available). But this shows that the product is exceptional and the support is equal to the product. Eternal Storms cares about their app and customers. If you use screen capture buy this product. You will not be disappointed. Copyright © 2016, Eternal Storms Software. All rights reserved.